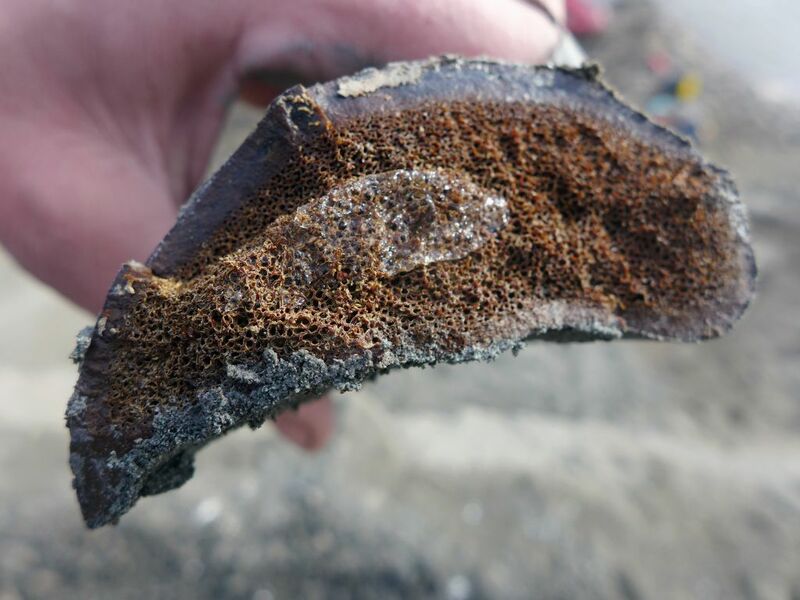 In 1967 Robert L. Liscomb, a petroleum geologist working for Shell Oil Company, discovered well-preserved bones in Alaska along the Colville River. As the bones were fresh, not permineralized, he assumed that these were recently deposited, perhaps belonging to a mammoth or bison. Twenty years later scientists recognized the bones as belonging to the duck-billed dinosaur Edmontosaurus. Other bones found in this deposit belong to horned dinosaurs, and various carnivorous dinosaurs (including a pygmy Tyrannosaurus). An article on Liscomb’s bones states: “The bones are stained a dark red brown but otherwise display little permineralization, crushing, or distortion.” (Davies, Kylie L., “Duckbill Dinosaurs (Hadrosauridae, Ornithisichia) from the North Slope of Alaska,” Journal of Paleontology 61, 1987, pp. 198-200.) Other researchers have found similar frozen dinosaur bones. For example, in 1987, while working with scientists from Memorial University on Bylot Island, just east of the northern tip of Baffin Island, a young Canadian Eskimo picked up such a bone fragment. It was identified within days as part of the lower jaw of a duck-billed dinosaur. (Helder, Margaret, “Fresh Dinosaur Bones Found,” Creation Ex Nihilo 14, 1992, p. 16.) In 2015 an article was published entitled “A New Arctic Hadrosaurid from the Prince Creek Formation.” It states: “The hadrosaurid remains are almost entirely disarticulated, show little evidence of weathering, predation, or trampling, and are typically uncrushed and unpermineralized” (Hirotsugu Mori, et. al., Acta Palaeontologica Polonica, Sept. 22, 2015, p. 3.). While freezing biological material like collagen obviously inhibits decay and helps preserve structure (from your left over turkey dinner to reptile bones) there are limits to how long it can be preserved. Is it reasonable to expect frozen bones to remain in this pristine condition for 60 million years?